Brooke is a small hamlet located on a minor road a few miles south of Braunston-in-Rutland. 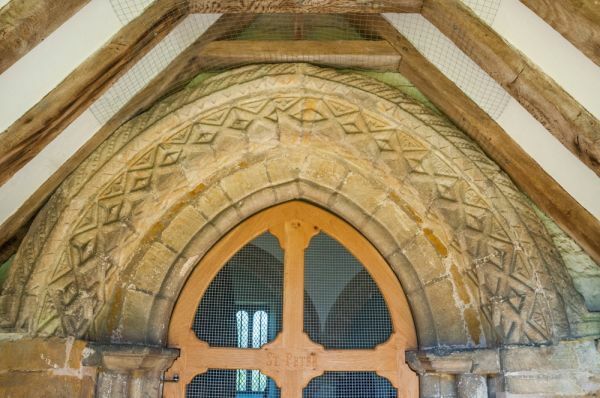 The parish church of St Peter boasts a beautifully carved Norman doorway. The nave arcade and the font are also Norman, while the tower was added in the 13th century. The tower is unusual in that each of its three stages is wider at the top than at the bottom. You enter through a very unusual Norman doorway. 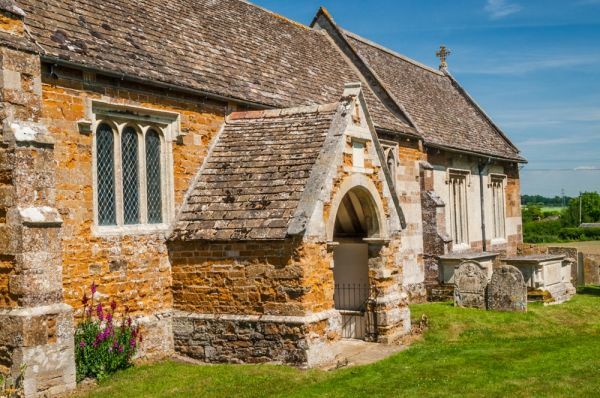 The unusual feature is that the doorway rises to a pointed arch, something not introduced into England for centuries after the church was built. How could this be? It seems likely that the doorway was indeed built in the 12th century as the traditional Norman carving on the moulding suggests, but that sometime in the 15th century the rounded arch needed strengthening to stop it from falling apart, and the top of the rounded arch was transformed into a pointed arch for support. The ancient wooden door itself is supported by two iron straps. The interior is a mix of Norman and Elizabethan features, or, as the excellent church guidebook puts it, 'Brooke has an Elizabethan church with a Norman spine'. The largely Elizabethan furnishings are blessedly unaltered. 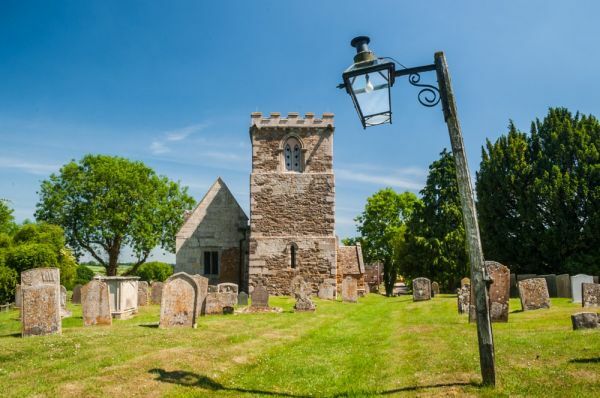 For this reason, St Peters was included in Betjeman's list of the top 100 churches in England. 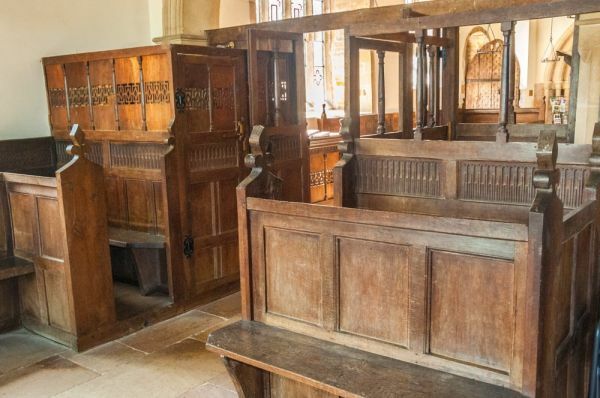 There are late 16th-century oak furnishings, including panelled screens and box pews. One interesting Elizabethan highlight is an unusual 'Communion Room' in the chancel. The tower is separated from the nave by a 16th-century wooden screen. On the north wall of the tower is an odd oval face carved in relief. It was probably used as a candle holder by bell-ringers. 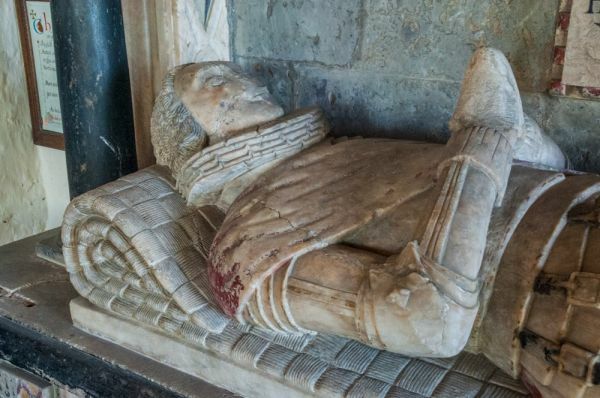 There is also an early 17th-century marble tomb to Charles Noble (d. 1619). 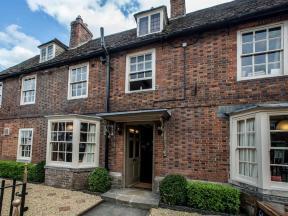 Noel was the son of Sir Andrew Noel, who built Brooke House. The Noel family later moved to Exton, where most of the family tombs can be found. 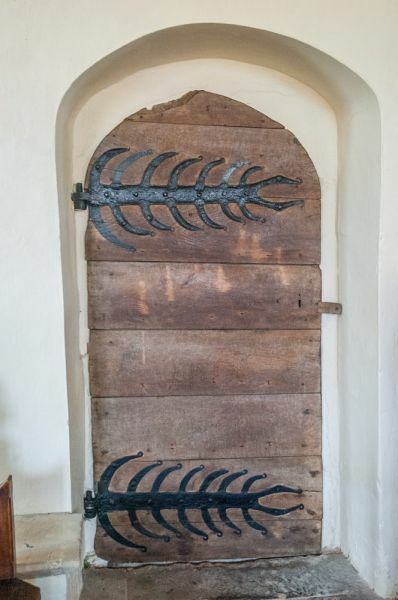 The north door is hung on a very unusual pair of iron hinges shaped like fishbones. Near the base of the north and west sides of the north aisle is a low stone bench. The bench was used by elderly or ill worshippers, giving rise to the old saying that the weakest go to the wall. 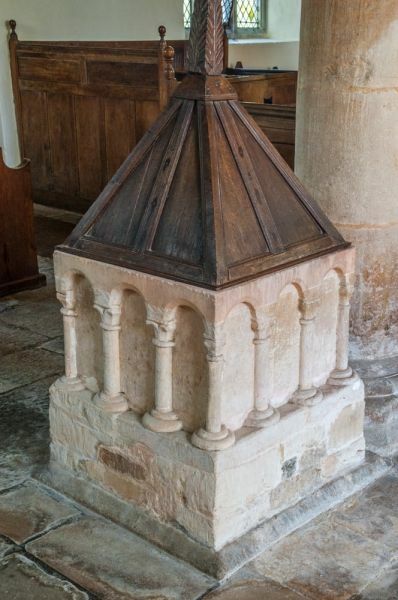 The wooden pulpit with its sounding board is Elizabethan. In the chancel floor are several grave slabs. Among these is a gravestone to Endymion Cannynge, who served as Captain of the Horse to King Charles I. He later served as Steward to Dowager Viscountess Campden, who died in 1698 at the age of 100. Another memorial is to Henry Rawlings (d 1742) and his first 4 wives. He was survived by his fifth wife. 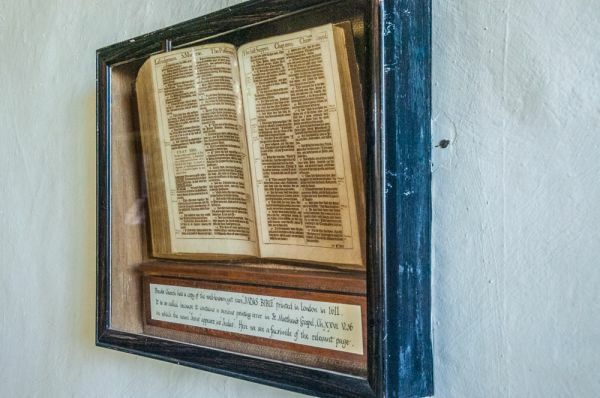 On the wall is a glass display case with a facsimile of the 1611 Judas Bible owned by the church. 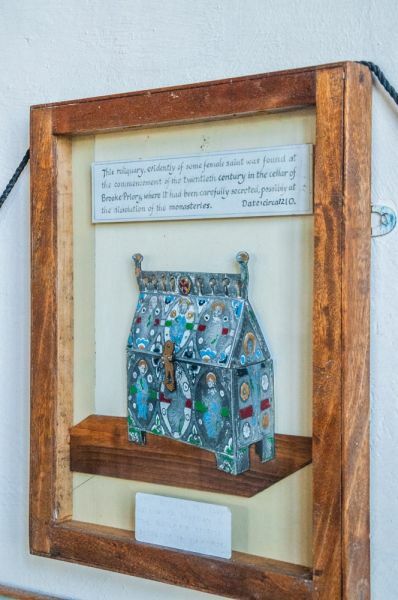 Also on the wall in another display case is an early 13th-century saints reliquary discovered hidden in the cellars of Brooke Priory. It had apparently been hidden in the Priory at the time of the Dissolution of the Monasteries. It isn't known which saint's relics were held in the reliquary, but the decoration suggests it was a female saint. Eagle-eyed movie-goers will notice that St Peter's was used in a scene from the recent film adaptation of the Jane Austen novel, Pride and Prejudice. 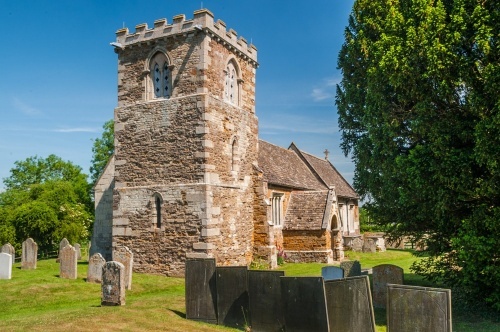 Brooke church is included in the useful booklet The Rutland Church Trail, published by Rutland Tourism. Location: On a minor road south of Braunston-in-Rutland. Roadside parking. Open daylight hours.